Graceland... Would you buy this story? Graceland...who is Graceland named after? Would you buy this story? When the mall was developed by Don M. Casto and Don M. Casto Jr. it was named Graceland Shoppers Mart... or the sign on the land called the future shopping center, Graceland Shoppers Mart in 1953. The shopping center opened in 1954. "Graceland was built on a former horse farm, named "Graceland", that was co-owned by a Columbus Bookmaker and his wife, a Madam. When the property came up for sale, the Casto and Gibson families purchased it for $100,000." Yes Graceland is named after Grace but would you buy this story? "Casto says it is named after his mother, not the Madam," but that story is commonly rejected, Hyatt said. Plus, that version "is just not as much fun." 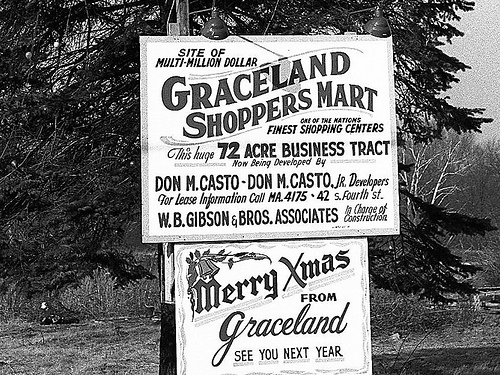 Photo Credit: Don O'Brien's photo of the Graceland sign from the 1950s is licensed with a Creative Commons license. He grew up in the Worthington area and has great Columbus and Worthington photos from the 1930s on, on his Flickr photostream. http://www.flickr.com/photos/dok1/ / CC BY 2.0 I believe this is one of the photos he took for the Worthington News. Graceland… Would you buy this story? Buckeye Valley Schools are Excellent!